Turning to the white metals, silver now posts a 0.3% weekly decline to bring spot prices to $14.18 per ounce. Palladium is up a slight 0.3% since last Friday’s close and currently trades at $988. And finally, the beaten down platinum market is showing some rare pop – up 2.4% for the week to trade at $806 per ounce. Platinum is rallying off the most deeply discounted levels on record when measured against both gold and palladium. Long-term investors who are betting on a mean reversion are looking forward to platinum eventually trading at a historically normal premium to the other precious metals. When that happens is impossible to predict, however. Since platinum demand is concentrated in the automotive sector, it doesn’t have the market breadth and centuries long history of gold and silver. Trading the gold to silver ratio for a likely mean reversion may be a surer bet. The ratio currently sits near a two decade high at about 85 to 1. Put another way, you can buy close to 85 ounces of silver with a single ounce of gold. That may be an attractive trade if you’re holding some gold. You may never have the opportunity to buy as many silver ounces with gold’s purchasing power as you can right now. If a normal mean reversion takes place in the years ahead, there will come a time when you can buy an ounce of gold for 40 ounces of silver. And if silver’s next bull market is as powerful as some analysts think it will be, you should be able to switch back into gold for 20 ounces of silver or even fewer. The classic monetary ratio of gold to silver was 16 to 1. A return to that level isn’t out of the question. That would likely happen only if and when a currency crisis and massive inflationary episode takes place however. Long-term pressures for a dollar devaluation are certainly building, but for now consumer price inflation in the economy is relatively mild. On Thursday, the government reported the Consumer Price Index rose 0.2% in August. That was lower than the 0.3% reading economists had expected. Year-over-year, the CPI is still running at 2.7% -- well above the Federal Reserve’s 2% target. The Fed is widely expected to hike interest rates again later this month. And this month also marks ten years since the collapse of Lehman Brothers. In the fall of 2008, credit markets froze, stocks crashed, banks went bust, and the entire financial system nearly closed down. A decade later, the stock market is in the stratosphere, private sector debt levels are at new record highs, official unemployment is near historic lows, and the economy is posting growth levels that haven’t been seen in well over a decade. Conditions today are in some ways eerily similar to those seen in 2007. Back then, CNBC commentator Larry Kudlow was touting the debt-fueled Bush economy as the “greatest story never told.” Now Kudlow is in the White House touting the debt-fueled Trump economy. Maybe it still has more room to run, but no boom lasts forever. The good times will come to an end, whether due to the politics changing after this November’s election, or the Fed going one rate hike too far, or just the market cycle reaching a natural exhaustion point. Every decade or so, a major shakeout in the markets seems to take place. The last one was in 2008. In 1998, Long Term Capital Management triggered a mini panic in which the Fed intervened to narrowly avert a full-fledged financial crisis. In 1987, the stock market crashed. And in the late 1970s, runaway inflation helped spark a mania in gold and silver. What will the latter part of this decade bring? We don’t know for sure, but the Fed seems determined to test the resilience of the economy and stock market by continuing to hike interest rates. And if history is any guide, the Fed will indeed go one hike too far. 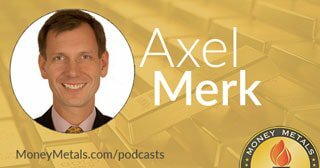 Well now for more on what the Fed might be thinking as it ponders further interest rate policy decisions and how our highly respected guest sees this all playing out and what it might mean for the metals, let’s get right to this week’s exclusive interview.